Mummy Of 3 Diaries: Beat those January Blues! #Win a £75 Argos Gift Card and Treat Yourself! Beat those January Blues! 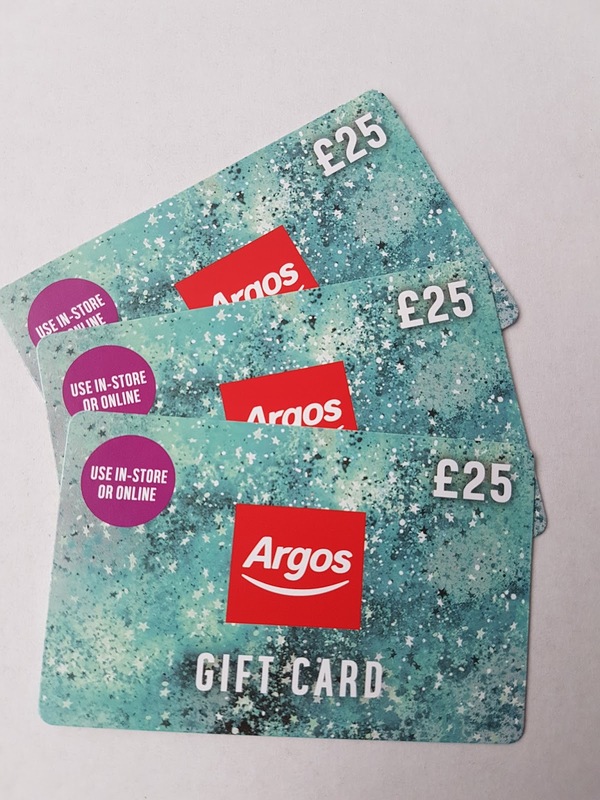 #Win a £75 Argos Gift Card and Treat Yourself! Win a £75 Argos Gift Card and Treat Yourself! The January Blues have started to set in here and I don't like it. A new year and new start can be quite daunting and often leaves us feeling blue but not today. As I have my final £75 Argos Gift Card prize to give away as part of our Chad Valley Play Panel competitions. On one hand, I am so delighted to be able cheer someone up with this lovely prize but on the other hand, it's my last one to give away so I'm also very sad. With £75 of Argos vouchers in hand, you'll be able to treat yourself to something really nice to cheer your January right up. The giveaway is really easy to enter, just use the Rafflecopter Form below to do so. Please feel free to do as many or as few of the entries as you'd like but do remember, the more you do, the more chance you have to win. One lucky winner will win £75 of Agros Vouchers. Terms and Conditions: The Giveaway will end in 14 days time on the 31st of January. 1 winner will be drawn at random using RaffleCopter from all the correctly made entries and contacted by email within 3 days of it ending. Open to the UK Only I'm afraid. Good Luck. I would get myself a new hairdryer. I would put it towards a new bbq for the Summer! I could do with a new kindle. I'd put it towards a TV for the main bedroom. It's my grandsons birthday in May and i'd love to get him chad valley transporter lorry plus cars, he so loves his cars and bikes. I'd treat my nephew to something for his 7th Birthday! I am finally able to decorate my daughter’s bedroom so would buy lamp, rug, clock etc for her room. I would buy the Chad Valley Airport Playset for my nephew. its Cayden's birthday in February and I know he would love some computer games. I would put towards a new car seat. I would buy some fitness equipment such as some new weights. I would put it towards an Ipad, which would be nice. Gadgets. Can't have too many of them! sorry to be a bit dull, but I really need to get y home office better organised and would probably use it on more storage and better lighting etc. Thanks for the chance to win. I'd treat my stepchildren to some Chad Valley Designabear goodies! Flowers, chocolate and champagne for my 60th birthday. A treat to myself for a change! I would use it towards my sons birthday presents. I would buy a new shower curtain and accessories for the bathroom. I`d buy a new kettle and toaster. I'd put the voucher towards this http://www.argos.co.uk/product/4596644 as our bed is broken and we sleep on the floor. I'd get some board games to play on these cold cabined up days! An Ottoman for the end of our bed! Ooo gosh I think I'd put it towards a nice present for my girls 9th birthday in March! I'm saving for a new camera so this voucher would be perfect. I'd love to get something for the garden. Maybe an arch or some obelisks. I would buy a new electric shower for our bathroom, as ours is getting very temperamental and keeps running cold. It would go towards a new fridge freezer! I would treat my little niece to the Chad Valley Pink Pop Up Ball Pit. Thanks for the lovely giveaway. I would buy my niece a new doll and pram. Some presents to put away for my granddaughters birthday. I would put it towards new bikes for my children. I'd get some new cushions for our sofa. Definitely some more storage for my girls rooms aka 'The Floordrobes'. If I injure myself on one more piece of lego I am taking the company that makes it to court for damages. I did get our youngest a little four drawer storage set to organise her toys but being on the spectrum the little monkey didn't quite get the aim of the organisation when I said to seperate the arts and crafts from the jigsaws etc. Instead she has decided to put 5 num nums in the one drawer, 3 of the same colour of playdough in the one drawer, 5 of the same colour in another and in the final drawer....you guessed it....more play dough of a different colour. I haven't the heart to say anything but it did make me chuckle (you definitley need a sense of humour with three daughters). I'd probably buy something for my son, maybe an Xbox game and put the rest towards something for myself! I would buy some furniture for my new flat! I would put it towards my daughters new bed. Love the look of the crane. I would choose the Chad Valley Premium Contactless Cash Register for my little boy. He loves doing his shopping with his trolley and playing at his kitchen so the till would be perfect for him! I'd put them toward a new bed for my son - his is broken and we're struggling to get the money together! I would buy a new rug for our front room as my feet are getting cold!! I would put it towards a highchair. I would spend towards a Slide for the garden for kids. Thank you. I would buy a fresh new bedspread for our bed. a new table for the living room! I'm in need of a new TV so I would put it towards that. I want an Air Fryer - trying to be healthy. I'd buy some new tableware. We hardly have anything that matches anymore! A juicer, we as a family went on holidays to Barcelona last year, and had the most amazing Apple juice, and the café used a fancy juicer. I would like to buy one! Some toys for next Christmas! I would love to win and buy some new bedding! I'd have to have a look, but possibly some tech. I would put it towards an Xbox for my sons 10th Birthday next month. He missed out at Christmas because Santa "ran out of room on his sleigh" (and mum ran out of money 😉). Chad Valley Tots Town Pirate Ship Playset for a cousin's birthday coming up. And some towels for me. I would love a sand table for the summer! A new microwave as we need one. A baby monitor as I am having my first baby in March! Oooh I would by some new bedding/linen and new pillows! I need a garden umbrella. Buying it now would help me look forward to sunshine. I have to loose few pounds so Fitbit for me. I'd put it towards a new laptop. Mine's on it's last legs. I would like a new keyboard and mouse. I would put it towards a pram for my 1st grandchild so my son dont have to buy one,so thank you for the chance. A fitness tracker watch . I'm currently training for my first half marathon in aid of my local foodbank and ONE would really help me to keep track of my ( very slow ) progress . I'd put it towards a games console for my son, he wants a Nintendo Switch for his birthday in April! I would use the voucher to buy a milk frother. I'd put it towards a bike for my 9 year old daughter. She's 10 in March and she said she wants a new bike. I'd buy some games and crafts things for the kids!